Achieve and maintain your in health and wellness. At Community Chiropractic Center in Greer we are passionate about serving our community by helping you reach your optimum potential in health and in wellness with a natural approach through chiropractic care. We are committed to keeping up with the latest research, advanced techniques and technology, in order to develop the most effective approach to chiropractic care for you and your family. We believe that everyone is born with the great potential and designed to function at 100%. Let us work together so you can experience this reality, as we become part of a community. Community Chiropractic Center is a modern facility known for its gentle, specific and affordable chiropractic care. We offer chiropractic care for all age groups as well as providing specialized care for pregnant mothers and infants. Corrective and wellness chiropractic adjustments are our only focus. Many people know that chiropractic care is great for back pain, auto injuries, neck pain, and headaches, but you might not know that chiropractic can be the key to a healthy lifestyle. The nervous system is the master system of the body. It controls and coordinates all body functions from the most basic to the most complex. The brain is like the super computer and the spinal cord and nerves act as super highways and roadways of the body to transmit messages that your body receives from the brain or outside environment and internal organs allowing the body to respond and adapt appropriately. The spine can shift out of alignment, causing pressure on the spinal cord and nerves, causing neck pain, back pain, dysfunction of cells, organs and tissues of the body. This is called a Subluxation also known as a Vertebral Subluxation Complex. Chiropractic care focuses on re-aligning the bones of the spine to correct those subluxations to achieve optimal function of the nervous system through its specific adjustments to. This allows the body to communicate properly without interference, addressing the issue at the root cause so you can achieve and maintain optimal function and heal naturally. One of the leading benefits of chiropractic care is not only that it corrects the underlying causes of many illnesses rather than merely treating the symptoms, but it’s natural, requiring no drugs or surgery. Creating a true experience of health and wellness allowing you to live a much fuller life, the life you were intended to live. While the cornerstone of all chiropractic care is to heal the body through the spine, principled chiropractic is different in that its primary focus is to not only add years to your life but life to your years on a model developed to achieve and maintain optimal health throughout life. It doesn’t just seek to correct the current condition and symptoms, but to enhance healing throughout life. While most chiropractic methods provide effective temporary relief with the use of ultrasound, cold laser, e-stem, cryotherapy, etc., true principled correction has lifelong benefits. We aim to remove any interference to the nervous system. Principled chiropractic care has been shown to correct ailments that are far removed from their spine without the use of drugs or surgery. The chiropractic adjustments correct underlying major causes of the issue rather than simply addressing minor surface problems. We want to change the paradigm of the “sick care” model our society has adopted, which treats symptoms after they arise. This line of thought has decreased our quality of life for far too long. Would you wait until after the dentist tells you that you have multiple cavities to start brushing? Like brushing and flossing your teeth, many of our patients see chiropractic care as regular preventative care. 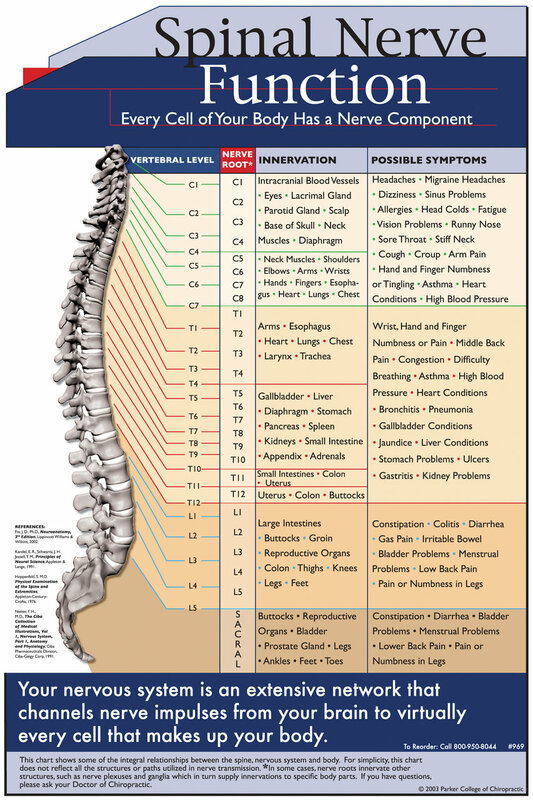 This is a chart of the nerves that come out of each respective vertebrae telling you what those nerves control and in the last column it tells you what symptoms you may feel with irritation to those nerves. This is the first step on your road to optimal health to achieve and maintain your fullest potential. With a comprehensive consultation and thorough exam, we will determine the best plan to provide relief and stabilize your spine through chiropractic adjustments. Think of this phase as putting out the fire. During the corrective care phase, we will continue your road to optimal health through chiropractic adjustments. This is a crucial phase in care as we are moving from symptom relief to long-lasting correction and stability. We know you want a long-term solution and not just a short-term fix. The ground work for that long-term solution begins during this phase as you move closer to optimizing spinal and neurological function. Optimal neurological function means that your nervous system is getting the right information to where it needs to go & when it needs to get there, so that you not only have relief but also perform at a higher level. This takes time just as you can’t expect to lose weight for skipping a dessert (or two) or to firm and tone your body with just one or two visits to the gym. Lasting changes take time and repetition. This phase is also known as the maintenance phase or wellness care. Consistent care is the phase that ensures the correction remains. We will build on the good work you’ve achieved up to this point. Our goal here is to keep you active and your spine stabilized while maintaining correct alignment over the course of your life. It will consist of less frequent “checkups” based on how well your spine holds an adjustment. The reality is that your health is your greatest asset, and prevention is the key to maintaining good health. At Community Chiropractic Center it is important for us to educate our community — the Greer community — on the importance of being proactive about your health rather than reactive. Think of this phase as how an orthodontist would prescribe a retainer after braces to be sure and hold the new corrections.